So you’ve decided that you want to give podcasting a try? Now you’re faced with one of the first decisions that all beginning podcasters face when it comes to equipment choices. That is: which microphone should I get? There are innumerable options out there and as many opinions to go with them, but let me share a little information from my personal experiences that should be of value to you as you make your decision. Let me say first of all, that lots of people who are interested in launching a podcast don’t always stick with it. That may be due to scheduling issues, loss of interest, or a variety of other reasons, but it is a fact nonetheless. The microphone recommendations below are presented to you with this fact in mind. This Behringer XM8500 is a great starter microphone. I currently have two of them in my studio that are used on a regular basis by my co-hosts and guests. While the old adage, “You get what you pay for” is generally true, and because of this, many would never recommend this microphone, I respectfully disagree in this case. 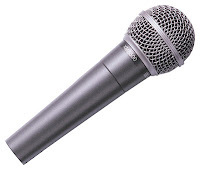 This microphone can be found for about $30 and is very similar in size and appearance to the Shure SM58, an old standard in many areas of the audio world, but is less than half the price. It’s heavy duty, durable, and comes with a hard plastic box in case you need to take it on the road. It sounds great and, in my tests, sounds just as good as the Shure SM58. You’re much better off (as far as audio quality) with this microphone than starting with a USB headset like I did several years ago. Especially considering the fact that a decent headset cost about the same amount. I highly recommend the Behringer XM8500 as a great choice in value and audio quality for the beginner podcaster. If you’re absolutely certain that podcasting is something that you’re going to do long-term and you want to jump into pro level equipment right out of the gate then this is the mic you want. The Heil PR-40 is an absolutely fantastic microphone that is used in professional podcasting studios around the world. It has amazing sound and does a wonderful job of reproducing the full range of the human voice. If you’ve got the budget for it, you certainly can’t go wrong with this microphone. As I said previously, there are many more choices out there that you can consider, but my recommendation would be to choose one of these two. If you’re just getting started and have a small budget and/or aren’t 100% sure that you’re in it for the long haul, then go with the Behringer XM8500. Sure you could grab a Shure SM58 for around $100, as many would recommend, but I’d say that you’ll do fine with the XM8500. Even if you’ve got the financial resources for the Heil PR-40, I’d hold off until you’ve made the long term commitment to your podcast so you’re not stuck with hundreds of dollars in equipment if you decide not to continue. The exception to that would be if you’re launching the podcast for your company/business; it’s worth it to have professional quality audio for your customers as this is a reflection on your business. Of course in order to use any of these microphones you’re going to need a mixer (unless you use an adapter). But again, you can start out small and upgrade later when you need to. Your mixer doesn’t have to cost thousands, or even hundreds of dollars. You can start out with a very decent mixer for less than a hundred bucks. The Behringer Xenyx 802 is a great choice to start with and is only about $65. However, if you know from the outset that you’ll be having multiple hosts and/or guests on the show then you’ll probably want to go with a larger mixer than has more features and can accommodate the multiple microphones. I hope that this information has been of use to you. I’d love to hear your thoughts on anything that I’ve written here. Please post your comments below. Disclosure: All product links are affiliate links.